Sure, all public schools can be free from primary to professional schools with the country taxation for the unemployed, the orphans, the low income people who cannot afford to pay schools. In this millenum, everybody should go to school and get a skill to get a job. Partners should get together to build some private schools at all levels for those who can afford it and to create jobs for teachers. Yon moun mande sou Facebook: Ayisyen, eske lekol gratis la, se pou 5 lane ou byen se pou toutan? 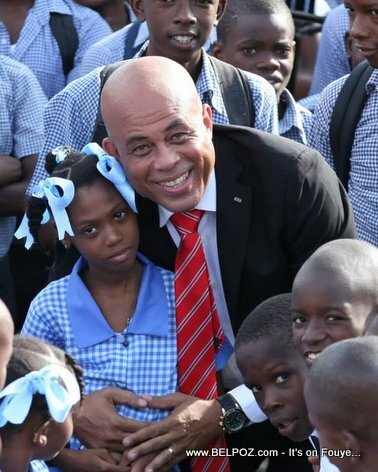 Prezidan ak anpil fos map diw bon travay ...ansanm poun met men pou peyi à pran yon lot chemen .c pa ni nan 10ans nap k chanje haiti.men to ou tard nap gen yon lot Haïti m kontan anpil lem map antre nan peyim pou janm Alez .prezidan m pa pa gen poum ba ou men du fond du coeur...bon travail e Felicitatyon map travay pi du poum supote fanmim yo haiti. wa Bénédicte dola 50nou yo ...wa kole ak saw genyen pandan yap palw pouw kontinye travay. Congratulations, there should be prayer before school starts so all children know the importance of God in their life. The Saint Esprit mass is obligatory at the beginning of the school year. School should allow at least 15 minutes of prayer at the beginning of the school day. School should teach the children to put God first in their life. Everybody should learn French in the primary school. All students should attend mass on Sundays. School is the apprenticeship of life. Let us go to school.